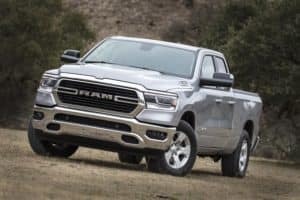 2019 Ram 1500 Big Horn features and specs | Orchard Chrysler Dodge Jeep Ram " "
Get to know the 2019 Ram 1500 Big Horn, a truck we proudly offer here at Orchard Chrysler Dodge Jeep Ram. This pickup has a good mixture of features, making it great for most people who need a utilitarian vehicle that’s also comfortable to drive every day. Visit us for a test drive. As your local Ram dealer in Washington, MI, we have an amazing selection of trucks for you to check out. Tackle any job, big or small, with the 2019 Ram 1500 Big Horn. Just like every Ram truck, it was made to get stuff done. Tow, haul, and go just about anywhere life takes you. Automatic headlights, front fog lights, and daytime running lights help you to see and be seen in a variety of changing conditions. The standard cargo light makes working in the truck bed easier, too. Active grille shutters close to boost aerodynamics and efficiency. When the engine and transmission need extra cooling, like when you’re handling a heavy load, they open to allow air to pass through freely. Nobody wants a wimpy truck, and the Ram 1500 Big Horn is definitely not one. This truck will pull through all kinds of tough situations, thanks to solid powertrain choices and more. The standard engine for the Ram 1500 Big Horn is the 3.6-liter V-6 eTorque. Technologies like two-step variable valve lift and wide-range variable valve timing boost efficiency and output, which tops out at 305 horsepower and 269 lb.-ft. of torque. You can tow up to 7,730 pounds* using this engine. You can add the burly 5.8-liter Hemi V-8 engine, which produces a nice 395 horsepower and 410 lb.-ft. of torque. Maximum towing capacity with this engine is 11,610 pounds*. For the maximum in performance, the available 5.7-liter Hemi V-8 with eTorque is the ultimate. It adds the mild hybrid system, pushing performance by adding a supplemental 130 lb.-ft. of torque when needed. That means the truck’s towing capacity increases to 12,750 pounds*. You control the TorqueFlite 8-speed automatic transmission with a black rotary shifter, which is easy to use. A five-link rear suspension provides heavy-duty support when towing or hauling, plus excellent comfort and crisp handling performance. One of the great things about the 2019 Ram 1500 Big Horn is every detail has been designed to keep you productive. Both inside and out, this truck is loaded with features you’ll appreciate on a daily basis. Using the standard integrated voice command with Bluetooth, you can communicate with others virtually hands-free. Use it to make phone calls without touching your device, start a music playlist, and more. A Uconnect system with a 5-inch touchscreen also comes standard. That means large icons for the menus, so you can make selections easier. 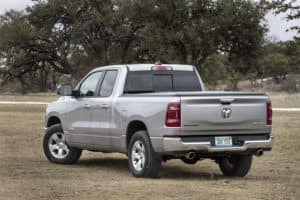 Armed with knowledge of the features and specs for the 2019 Ram 1500 Big Horn, this is the perfect time to set up a test drive. Contact Orchard Chrysler Dodge Jeep Ram today to make an appointment. *Weights provided are estimates only. Always check manufacturer labels for actual weights. Properly secure all cargo.